Continuing my string of posts on trying to get OpenVPN working through China’s Great Firewall… and a recent (and unexpected but much appreciated) report that TCP & UDP ports are blocked quickly, I’m now looking at getting OpenVPN to work with stunnel. My assumption is that the GFW is detecting the OpenVPN packets, since they’re not pure SSL, and then blocking the IP & port combination. (Yay for packet inspection.) So, right now, I’m thinking use stunnel to wrap the OpenVPN packets in a pure SSL connection. Of course, performance is going to suffer, since we’re now triple layering TCP (first layer: stunnel, second layer: OpenVPN, third layer: the actual web browsing). The important thing to note here is that the IP address of the OpenVPN server needs to be specified – OpenVPN listens on a specific IP address. (YOu can verify this by looking at the output of netstat -nlp|grep openvpn). I tried using 127.0.0.1, but the OpenVPN client kept on failing to connect. 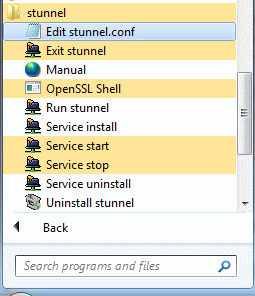 The easiest way to get at the config file is to find stunnel in your Start menu, right click on the “Edit stunnel.conf” link and select “Run as administrator”. Because this is more a trial run than anything else, I didn’t do much optimization and securing. However, two documents popped up in my Google searches but were not immediately useful: this, while being aimed at Debian users, has some interesting stuff on optimization (particularly the TCP_NODELAY options that look useful), and this, which has a bunch of stuff on using client certificates for authentication – something which is good to prevent MitM attacks (which might be used), so I’ll be looking into getting that running sometime later. This entry was posted on December 26, 2012, 10:30 pm by Kyle Lexmond and is filed under Sysadmin. You can follow any responses to this entry through RSS 2.0. You can leave a response, or trackback from your own site. Hi! Thanks a lot for the hints. I have been running a personal vpn for months and now the new enforced policies are heavily disrupting its functioning. This is especially true for Beijing and China Unicom. I’m expecting the policy to be soon expanded nationwide. MitM attacks do occur. From time to time I see certificate warnings with unexpected data in the certificate details. Therefore a certificate challenge based authentication is desirable. Using a VPN over socks seems a good idea. The only issue is that by encrypting the all the communication the Great Firewall will notice a 100% encrypted traffic, which is unrealistic in normal life patterns. The Great Firewall caps encrypted connections to 3-60Kb/s max speed, drops 30% of packets most of the times and often kills (resets) the connection. A “persistance” mode is therefore advised to avoid information leackage (i.e. only allow outgoing connections for the socks/vpn ip). This makes real life internet browsing very hard and will have an impact on small business that relies on home-level internet packages. All pretty good points and information there. Bit worrying about the probable future expansion nation wide, and the MitM attacks. I wonder if they’re going to move to a policy where systems bought in China will come pre-installed with an extra trusted root certificate owned by the government, and HTTPS connections will be terminated at the router, inspected and resigned with the government cert. Enterprises are doing this, it’s not too much of a stretch to think that this would be used, considering that HTTPS is currently not inspected. Re the throttling encrypted connections bit, that’s interesting – is throttling still done if the other unencrypted connections are made? My main justification for setting up OpenVPN was that some sites and FaceTime/Skype would be restricted and I’d want to use them, but with reports of FaceTime & Skype not being blocked makes me wonder if using Firefox + FoxyProxy for specific sites might be a good way around the firewall that wouldn’t face degradation of speeds. I’m not too worried about information leakage, only being able to (fairly reliably) access blocked sites. And now that you mention home-level internet packages… any news if business/uni internet access are facing similar/less/more restrictions? There has been very little information published that I’ve found on the restrictions on the varying classifications of connections. Yes I also can foresee this is the ultimate target. After all we have to remember that what bothers a government is the majority of the people. If a handful of individuals do not comply with the regulations and mind their own business, they are likely ignored. Re throttling, this only applies to SSL connections. It does not affect unencrypted traffic, either it being concurrent or subsequent. Local Chinese connections are always at highest speed allowed by the internet package. Speed degradation is not terrible for browsing, but is impossible to watch any kind of movie. You can set Foxyproxy to whitelist only *google.com/* and use the normal connection for loading other websites’ content. Skype is not restricted. It has never been. You can freely use it. Just remind to save your setup package as within China you are forced to use the government-approved Skype version should you need to re-download it from skype.com. Yes, I confirm you that home-level internet packages have more restrictive censorship than business-level ones. For instance connecting to overseas websites often takes ages (and several timeouts) during evenings with home packages. At the office, instead, performance is very good and I can use my openvpn connection still nowadays. At home, you know, it is automatically blocked now. There are also differences between cities and providers. Unicom is told to be more restrictive as it is a private company (49%). Stakeholders’ interest has never been freedom, just money – and they want to secure the business licence for operating in China. Big cities and sensitive provinces also have more restrictive policies (with Beijing being the worst). Interesting, we did the same thing for access the OpenVPN via Great Firewall. So no, it wouldn’t be likely to help without further modifications.